Create, manage, import & export extra data fields (metafields) for your shop, products, collections, variants, customers, orders, blogs, articles & pages. Shopify has a somewhat obscure feature called metafields which is typically available only for developers through the Shopify API. 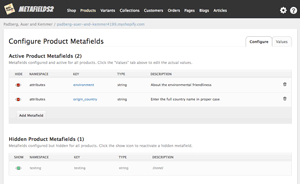 Metafields are simply extra data fields you can configure for your shop, products, variants, collections, customers, orders, blogs, articles & pages. 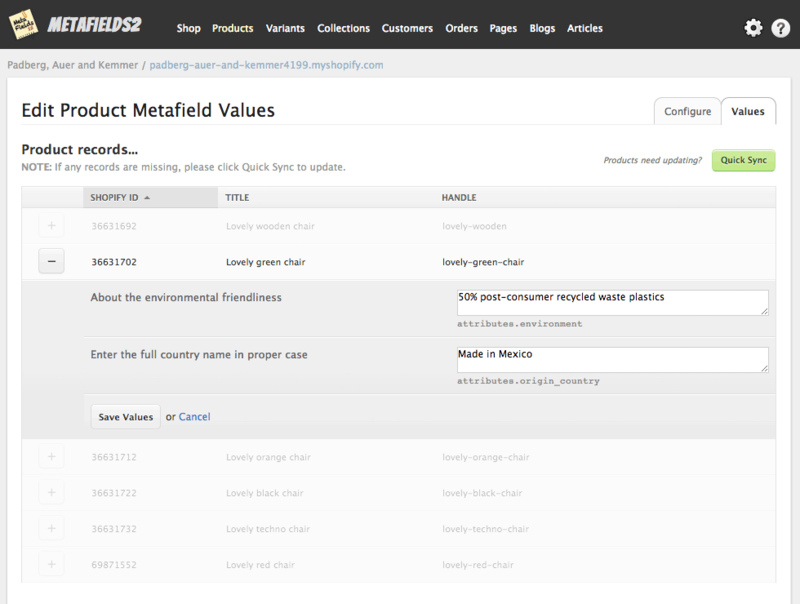 The Metafields2 application allows you to configure, manage, import, and export metafields in a simple web interface. After the free 7-day trial period, the Metafields2 app converts to a flat monthly charge for all stores. No more plan-based pricing. All billing for the application will be handled through your Shopify account, no separate payments are necessary to us directly. QHow can I edit the metafields for Shopify's Google Shopping app? This is possible and a popular usage of our app. If you are not seeing the Google shopping metafields displaying in your Metafields2 app screens to edit or import/export, a few simple steps are needed. First an explanation - metafields are a Shopify feature (albeit under the covers) and a limitation of metafields that we cannot override is that they cannot contain a blank value. This means that until you add values for the four Google shopping metafields for at least one product, our app cannot see them. This is true even if you can see them in your Shopify dashboard when editing products. If you have installed Shopify's Google shopping feeds app and you don't see the metafields in our app after all sync jobs have finished, simply go to one of your products in your Shopify dashboard, enter values for all four of the Google shopping metafields and click Save. 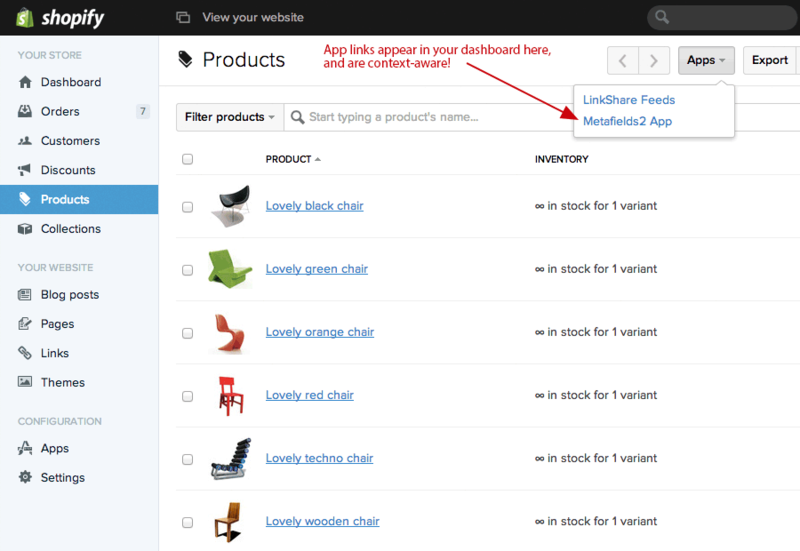 Then click the apps button (three dots or ellipsis) in the toolbar and choose "Metafields2 App - Products." This will load our app and sync the four metafields for all your products at once. From this point forward you should be able to add/edit these values as you would expect, including export and import via CSV in the utilities screen of our app, accessible by clicking the gear icon in the navigation bar at the top of the screen. QI have two Shopify shops with the same products, how can I export and import metafields from one to the other? IMPORTANT: Remember when switching from one shop to another you will need to logout of the Metafields2 app in one shop before opening the app in another or you may end up using the app thinking you are in one but still logged into the app for the previous shop. QHow does the Metafields2 app integrate with my Shopify admin dashboard? QWhat should I enter as the 'namespace' and 'key' attributes? QWhy can't I change the namespace, key or type of a metafield once it contains values? This is a restriction of the Shopify API to avoid some potentially serious problems. However, you can export your existing metafield data into a CSV file, change the namespace, key, or type of the field, and then import the CSV file which would create the new metafield preserving your existing data. You could then simply delete the old metafield and it's data. QWill the import process delete any metafields I leave out of the CSV file? No. The import process is generally non-destructive in that it will only create or update the metafield values that are contained in the CSV file. It will not delete any of your other metafield data, with one exception. If you want to force a metafield value to be deleted during the import, use the literal string value '[BLANK]' (without the quote marks) and this will signal to the import that you want to force the value to be deleted or blanked out. Please be aware though that because the Shopify API does not allow a metafield to be saved with an empty or blank value, the app will actually delete that individual metafield instance entirely. This shouldn't be a problem or affect you in anyway really, the app handles all this behind the scenes for you. If, however, you are also using the Shopify API to retrieve your metafield data, bear in mind that a metafield with an empty/blank value in the Metafields2 app means the metafield actually does not exist for that individual resource. If you want to globally delete a metafield, a simpler way to do so would be in the appropriate 'Config' tab in the app's interface. If the metafield contains data, you will be prompted for a specific typed confirmation response to proceed so it would be difficult to accidentally wipe out all the data for a single metafield. QWhat is the Quick Sync feature? 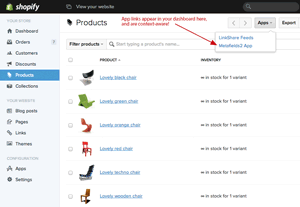 The app tries to maintain references to all of your Shopify resources (products, variants, blogs, orders, etc.) thru an initial sync that occurs after you first install. This is what allows you to edit your metafield values for multiple resources at a time in the app's interface. But as you add or remove products from your store, the resource references in our app can become out of sync. For this reason, we have enabled the Quick Sync feature which displays on the values tab views where you see your store's resources listed. We will popup a reminder if you go more than 7 days without running a Quick or a Full sync (from the Utilities screen). QWhat does it mean to Hide or Show metafields? Because metafields have been around for a couple of years and used by numerous developers and third-party apps, you may already have existing metafields in your store which are imported during the initial sync (and subsequent) process. Some power users really like having full control over all the metafields that exist in their store, including those added by other apps or developers. But for most users, it is distracting to see those other metafields mixed in with the metafields you yourself create in the app's interface when editing metafield data or in exported CSV files. So for this reason, the show and hide feature was added. 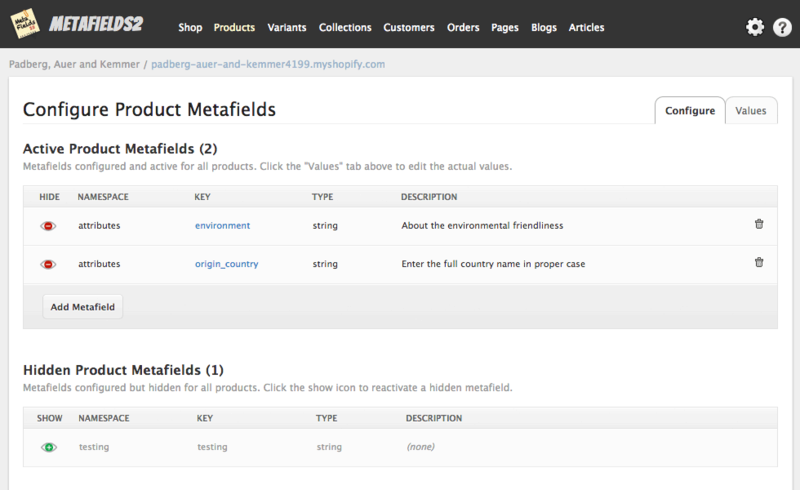 Hiding a metafield simply hides it from the values editing screens and export files in the Metafields2 app only, it does not remove any data or hide the metafields in your Shopify store whatsoever. To put it another way, these hidden metafields will continue to work and be used by your other apps and in your templates normally, hiding them has no impact on them use outside of the Metafields2 app. QDoes this app help with SEO, can I create meta tags for example? The Metafields2 app is NOT specifically an SEO app enabling meta tags. Although the name metafields might make you think of meta tags at first, the resemblance is entirely coincidental. Its name is simply the same name Shopify gave this 'extra fields' feature via their API (http://docs.shopify.com/api/metafield). This blog article from Shopify introducing metafields is also helpful. With that said, you can certainly use this app for meta tags or any other 'extra' data you want to attach to Shopify resources for SEO purposes, but its utility is much, much broader and the use cases are really limitless. QI created metafields with data using your app, so why are they not displaying on my storefront? 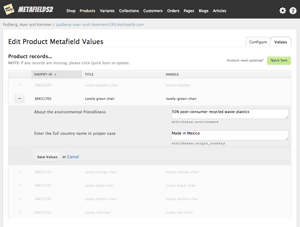 The Metafields2 app will allow you to create, manage, and add data to metafields in your store but makes no changes to your themes or templates on your behalf. To put the metafields you create to use in your themes, you will need to do so manually with some Liquid code in your templates, they will not automatically display or trigger any special functionality for your store. For reference, this article in Shopify's online theme documentation should be helpful. QWhat is the format of the CSV import/export file for metafields? The fastest way to see the format is to generate a template using the Metafields2 app's export utility. First, create your metafields in the configure tab of any/all resources desired if they don't already exist. Then in the Utilities view of the app (click the gear icon in the header), run an Export job selecting the desired resources. Once this finishes you can download and view the export.csv file it creates as a ready-made CSV template for your use to edit with values and then import. QWhy is there no Apps dropdown menu in the Customers area of my Shopify dashboard? Currently (and somewhat oddly) Shopify does not give apps the option to add links to an Apps dropdown menu in the Customers area of admin. We have developed a bookmarklet that you can add to your browsers bookmarks bar that should help you here. Whenever you are viewing the Customer listing or any specific Customer in your Shopify dashboard, just click the bookmarklet to jump to the Metafields2 app to edit metafields for all or just the one specific customer you are viewing. To add the bookmarklet, drag this link Metafields2 Customers to your bookmarks bar, or right-click (option-click on Mac) and select the option to add the link to your bookmarks bar. For more information on bookmarklets and how to add them for your specific operating system and browser, try this page ... About Bookmarklets. Send us your questions, comments, or suggestions and we'll reply promptly.